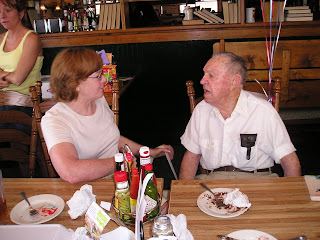 This is my my uncle Ray Robert "Bus" Hunter talking to his niece Alice "Rusty" on his 98th birthday May 31, 2004. He died ten months later. They lived in Douglasville, Georgia. He lived almost six lives longer than his wife Zelma. Unfortunately he buried his only child Jerry also. Jerry was a pilot and shot down in the Vietnam War. As a teenager Bus wanted to be a professional wrester or boxer, with his older brother as his coach and manager. I think he met someone stronger than he that taught him fighting was not as glamorous as it looked. He was a lineman for the Douglas County REMC. At his funeral the preacher told that he heard one time Bus, with incredible strength, lifted a line pole, in an emergency situation. At his 90th birthday party he was as sharp as usual, quoting long ago poetry and prose and having quick comeback wit. He told me the year before at a family get together that he quit cutting his grass and is paying someone else to do it. 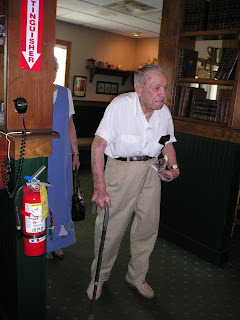 About a year before he had a stroke and walked with a cane. Bus was the last sibling of nine to go. In the early 60s I worked with a guy named Red from Douglasville. Red asked me was I related to Robert Hunter in Douglasville. The nickname Bus was a family name, Red knew him as Robert. They played pool together at the local pool hall. He said Bud was a very good pool player. Surprises, surprises! Hunter Memorial Park is named after his son Jerry. It is mostly a sports park with baseball diamonds, tennis courts, etc. It also has a small choo-choo train that pulls kids around the perimeter of the park. At the entrance of the park is an out of commission F-105 jet plane with Jerry's name on the side. At every Memorial Day, Veteran's Day, and any other time the people pay tribute to those who gave their lives for the defense of their country Bus would be right in there - in the middle of paying tribute. WOW! 98. My maternal great grandfather and mother lived to 98 and 93, and my grandmother died at 91. Unfortunately the long lives stopped there, as each of her children died in their 70's. My dad was 91 when he died also. Both my parents died at age 77. So, with a little bit of luck and a big change in life style, hopefully I'll make it to that age, which is only ten years away (gulp!). Last year I was visiting my mother in Douglasville and we took the kids to Hunter Park. I have pictures of my kids on the train, feeding the ducks, and in front of that F-105 fighter. Indeed it is a small world. I feel like dolls are all around me all the time singing, "It's a Small World!" My favorite thing about Bus late in his life - especially after he became the only one of the "boys" left - was that he would walk in to a family function/visit and introduce himself as "Old Man Hunter" to everyone he met. Always had that great smile and sense of humor. I agree, he had a very quick wit. I always considered myself kinda of witty - but nothing compared to "Old Man Hunter". The Invisible Couple Strike Again.